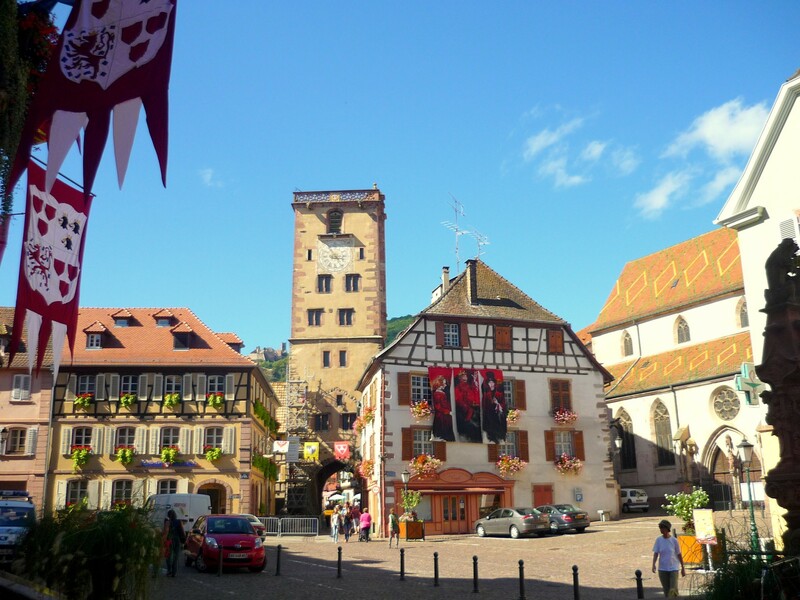 A major tourist hub along the Alsace Wine Route, the town of Ribeauvillé is framed by fantastic views of vineyards and rolling hills extending to the foot of the Vosges. The mountain overlooking the town is crowned by three ruined feudal castles, giving this site an enchanting touch. 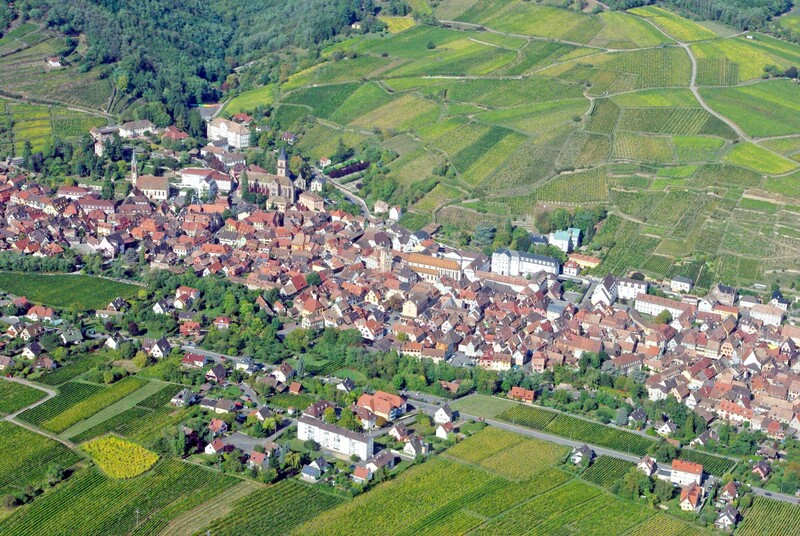 Renowned for its Riesling and Gewurztraminer white wines, the vineyards of Ribeauvillé produce local Grands Crus Kirchberg, Osterberg and Geisberg. 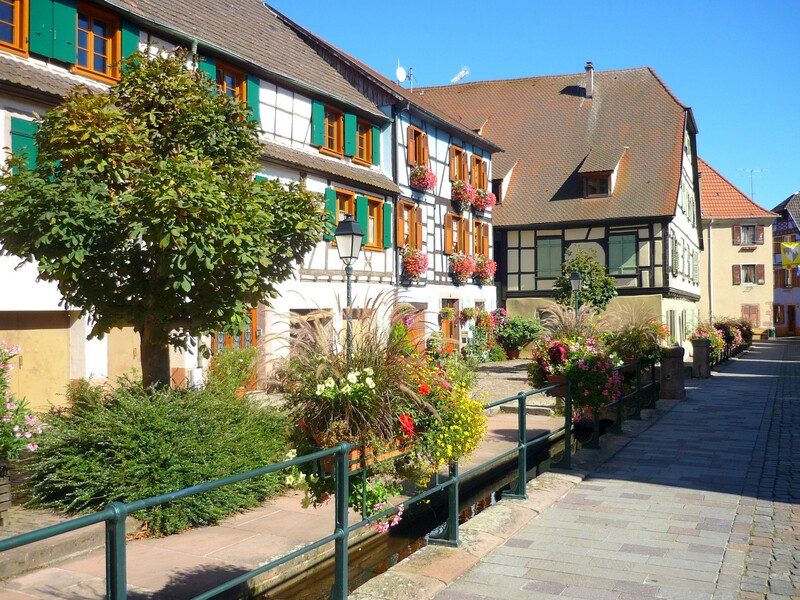 Start your visit of Ribeauvillé by parking your car near the Jardin de Ville and Place du Général de Gaulle from where you can reach the semi-pedestrianised Grand’Rue which threads its way through the whole town of Ribeauvillé, and is lined with several fine half-timbered houses. The Octroi house was where the tax on trade coming in and going out of the low town was paid. One of its rooms (the former guardroom) now houses Ribeauvillé’s Tourist Information Centre. In front of the house, the Winegrowers’ fountain, built in 1909, evokes the importance of winegrowing in the local economy. 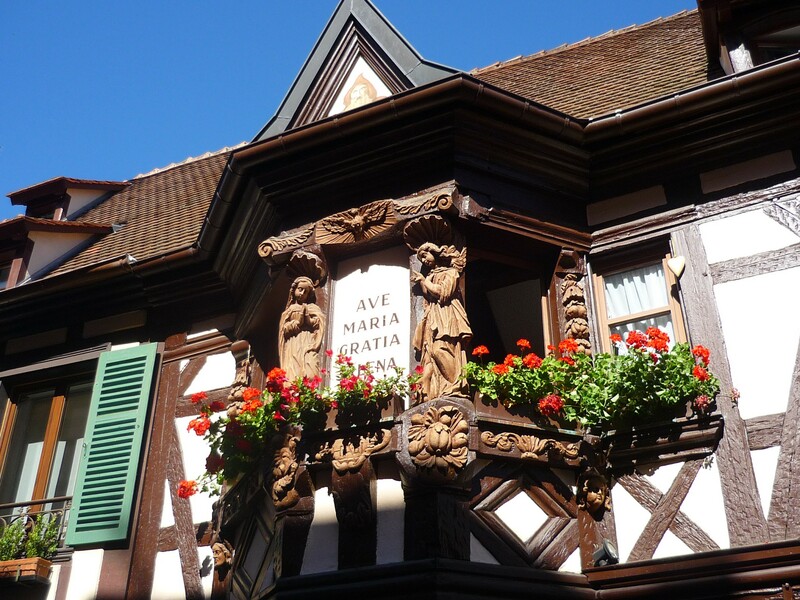 Also called “Auberge des Ménétriers” (Minstrels’ Inn), this is one of Ribeauvillé’s finest half-timbered houses. The beautiful loggia above the door dates back to 1663 and carries the inscription “Ave Maria Gracia Plena” referring to the Dusenbach pilgrimage devoted to the Virgin Mary. The two wooden statues standing on the loggia depict the Annunciation. The Brotherhood of the Minstrels (Confrérie des Ménétriers), first mentioned in 1390, operated under the protection of the lords of Ribeauvillé. 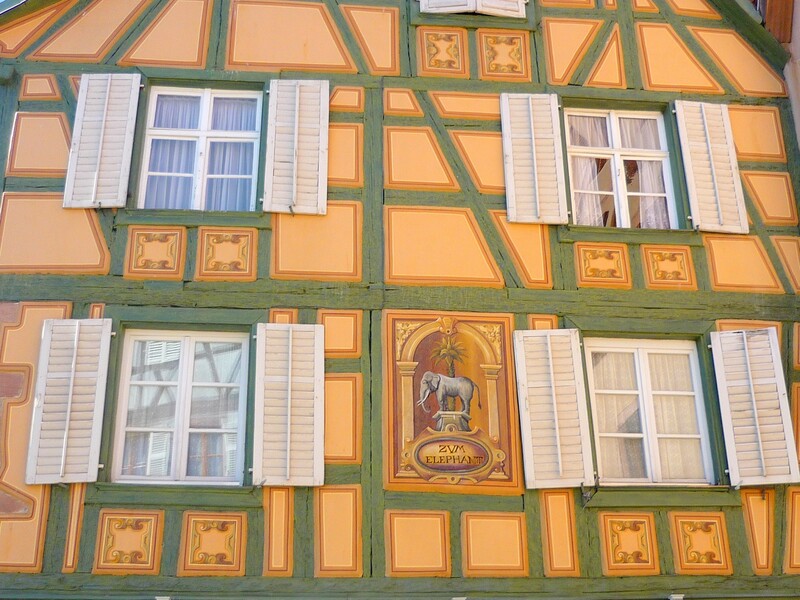 Bearing a surprising name for an Alsatian house, the Elephant Inn (Auberge à l’Eléphant) dates back to 1522. It owes its name to the elephant pictured on its half-timbered façade. It became theRestaurant de la Poste, a reference to the old staging post which used to operate at the end of Rue de la Halle aux Blés. Bordering the Grand Rue, the little church devoted to St. Catherine was first mentioned in 1346 as the seigniorial hospital’s chapel. It was used as a sepulchre by the Ribeaupierre dynasty, whose coat of arms can still be seen in the Gothic style arch over the choir gallery. Today, the chapel is an exhibition hall. The Town-Hall Square (Place de la Mairie) marks the boundary between the Lower and Upper towns, linked by an impressive fortified gate. It is also lined with fine buildings such as the town-hall. The Town-Hall was built in 1773 and houses an interesting collection of gold plates and silver goblets from the 15th to the 17th centuries, donated to the Town by the Lords of Ribeaupierre. The Butchers’ Tower (Tour des Bouchers) separates the Upper Town (Ville Haute) from the Middle Town (Ville Moyenne). It is named after the abattoir and the butchers’ stalls which used to be located just beside it. The lowest part of the tower was built in 1290 and in 1536 it was decided to raise it to 29 metres. Often threatened with destruction, it has become the emblem of the little town. On the same square, opposite the Town-Hall, stands the church of the Augustines Convent, now church of the Sisters of “Divine Providence”. It is decorated with a canonical sundial in the corner of the sacristy (Rue des Frères Mertian). 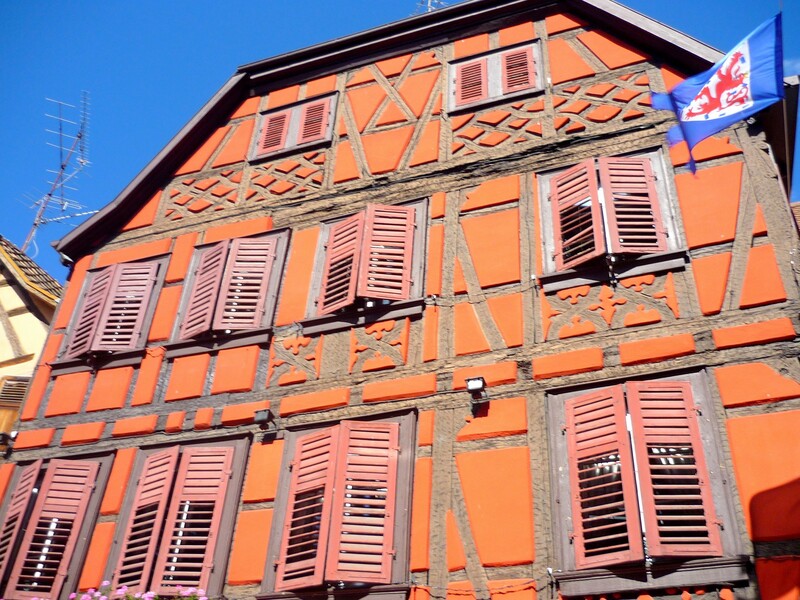 This remarkable red-painted half-timbered house (Maison Siedel) is now home to a butchery. It features some interesting timber shapes: curule chairs and “gugloch” (small side windows where people inside can see without being seen from the outside). This beautiful little square is lined with fine houses such as the Sun Inn (Auberge du Soleil) which was once the meeting place of the local musicians and the Sheep Inn (Auberge du Mouton), an old post house. In the middle of the square stands the fountain built by native André Friedrich in 1862 and which personifies the town of Ribeauvillé, its agriculture and its industry. 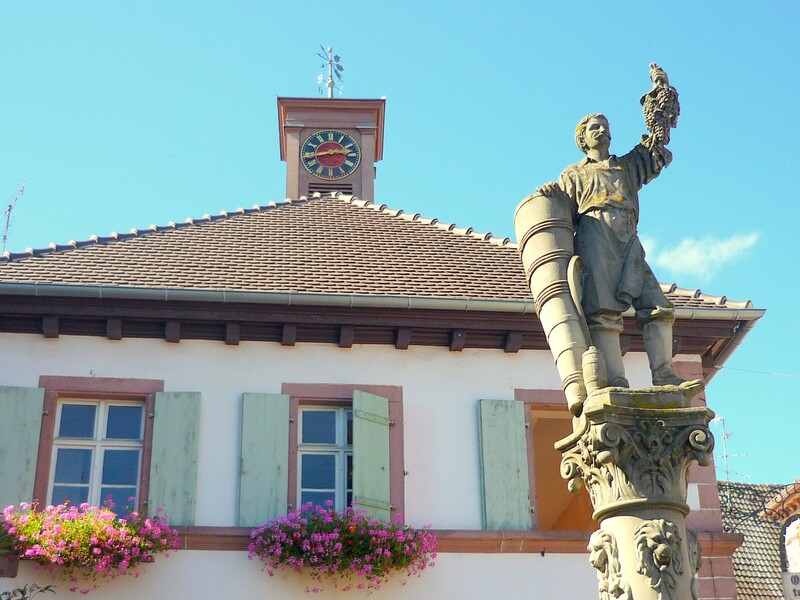 In the past, the fountain was used as the town gauge (zinnen in Alsatian dialect) hence the name of the square (Sinn). A few metres off Grand Rue, at the end of Rue du Château, Église Saint Grégoire is the Catholic parish church of Ribeauvillé. 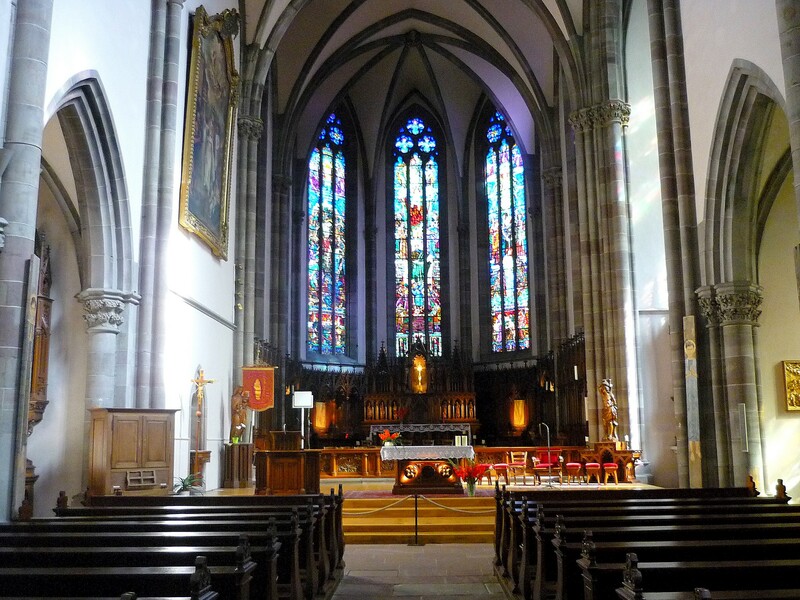 Construction of the church started in the 13th century and its Gothic nave was completed in 1473. Inside, the keystones feature the coat of arms of the Ribeaupierre dynasty, of the city of Colmar and of the bishops of Strasbourg and Basle. 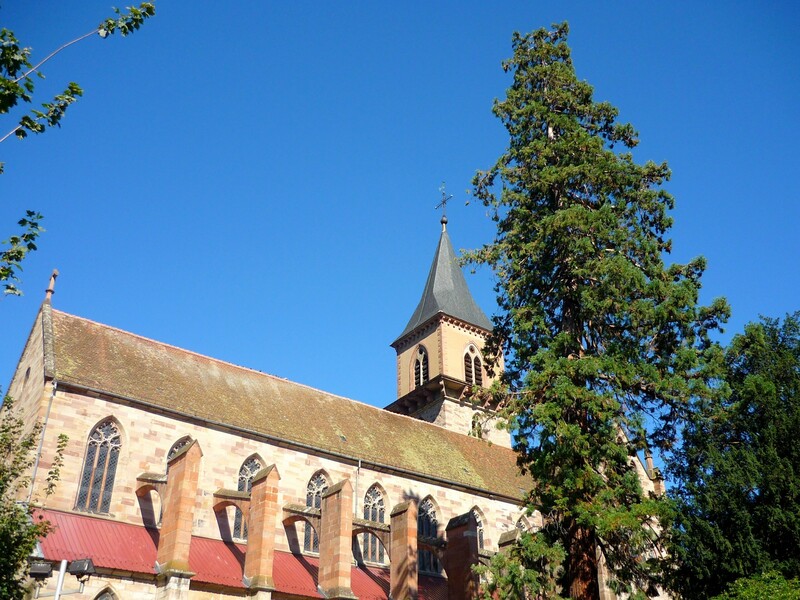 Beside the church is the old Priest’s Cemetery (Cimetière des Prêtres) with its soaring sequoia planted in 1856. 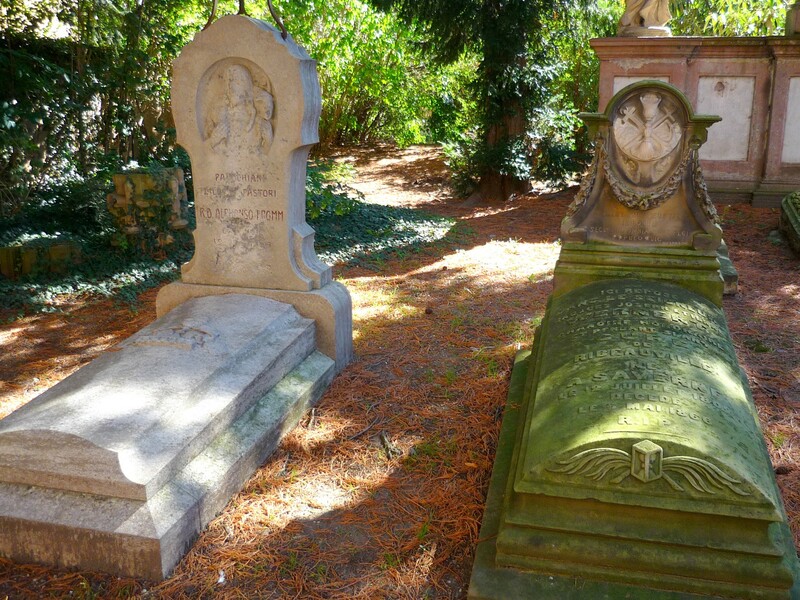 Most of the priests in charge of the church have been buried here, the oldest tombs dating back to the 15th century. A hundred metres away from St Grégoire on Rue du Temple, stands the Protestant church built in 1783. Marking the limit of the historic town of Ribeauvillé, Place de la République and its statue dating back to 1576 can be reached from the Grand’Rue. 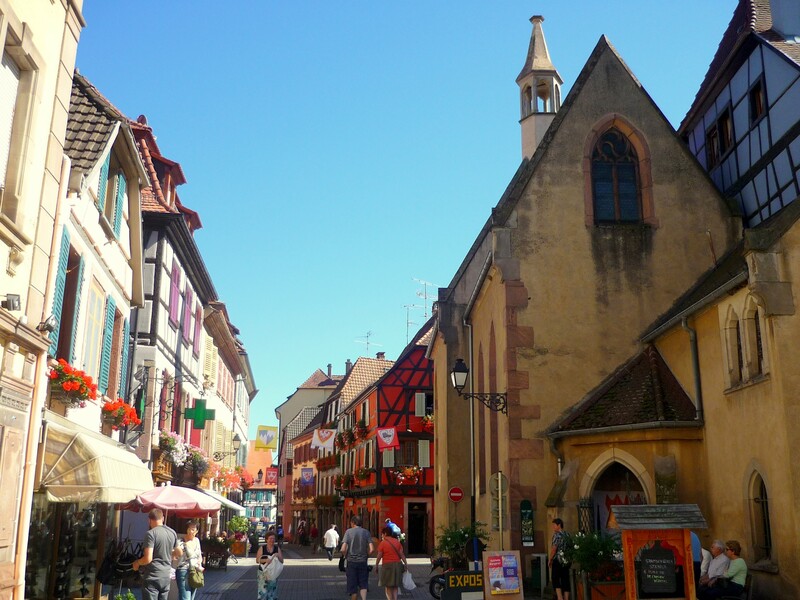 Just before arriving at the square, the Grand’Rue offers a picturesque sight of the narrow canal running along the old street.From the square, there is a fine view of the ruined castle of Saint-Ulrich at the summit of a hill. At the top of the square, a fortified gate (now disappeared) used to guard the entry to the town. On the first Sunday of September, the Fiddlers’ Festival (Pfifferdaj) celebrates the “day of the fifes” in Ribeauvillé. 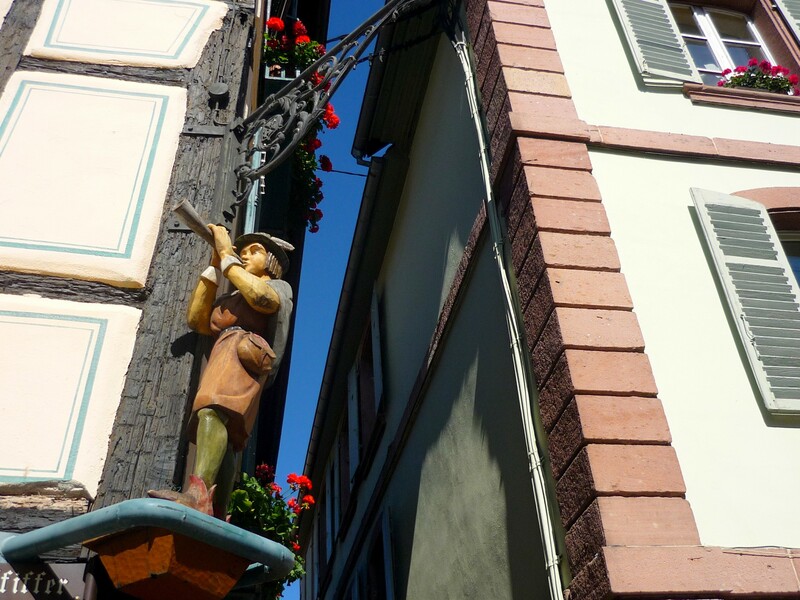 This is one of Alsace’s oldest festivals when travelling musicians used to gather in the town to pay homage to their suzerain. The brotherhood of musicians grew so strong during the Middle-Ages that it became a corporation whose statutes were recorded by the Council of Colmar. Since 1481, the fiddlers’ brotherhood has met in Ribeauvillé in order to elect their king. Today, the lively celebration has evolved into a folk festival with a historic procession of floats depicting a series of plays on medieval life. Hundreds of actors dressed in authentic medieval costumes are surrounded by a host of street entertainers, jugglers and fire-eaters. Each year, a different theme linked to the Middle-Ages gives rhythm to the event. A free wine-tasting takes place at the fountain near the Town-Hall. 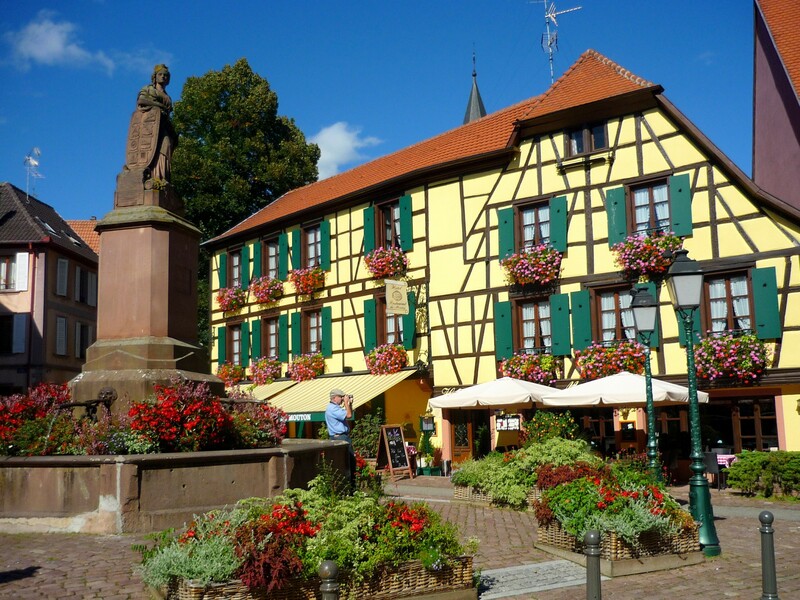 The Ribeauvillé Christmas Market is possibly the most fancy of those encountered along the Alsace Wine Route. Visitors are plunged into a joyful medieval atmosphere where the stallholders and organisers put on fancy medieval dress. Hand crafted items such as candles, Advent wreaths and nativity scenes can be found; while traditional food and drinks are served: roasted boar, beer and wine, and local sweet delicacies. This market is definitely a show for young and old: stilt walkers, jugglers, fire-eaters and musicians, all stride along the medieval streets of Ribeauvillé to the amusement of all. Check out the official website of the Ribeauvillé Tourist Office.